Heat oven to 375°F. Lightly grease 12-inch pizza pan. Unroll 1 can of dough; placing in greased pan. Starting at center, press out dough with hands to edge of pan. Layer pepperoni, mushrooms, olives and provolone cheese over dough. Unroll remaining can of dough. Press out dough on work surface to form 12-inch round. Fold dough in half; place over provolone cheese and unfold. Press outside edges to seal. Cut several slits in top crust for steam to escape. Sprinkle with Parmesan cheese. Bake 30 to 35 minutes or until crust is deep golden brown. Cut pizza into wedges; serve with warm pizza sauce. Vary the calzone filling with your favorite pizza ingredients. Try an all-veggie version with chopped broccoli, bell peppers and onion with shredded mozzarella and Parmesan cheeses. 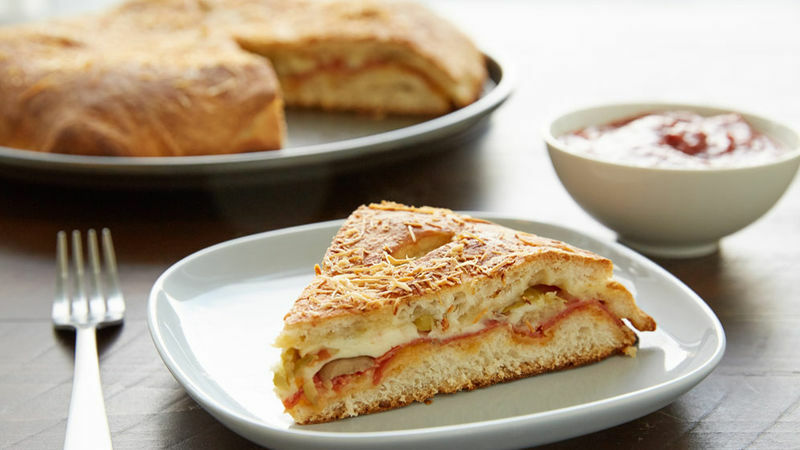 Calzones are the perfect hybrid—part pizza, part sandwich. 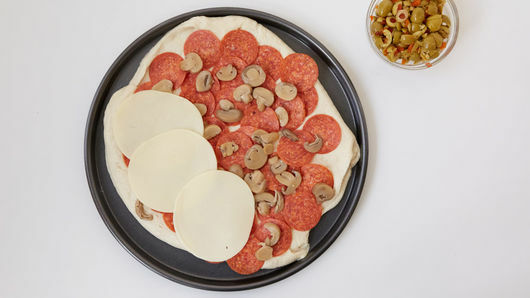 By tucking pizza fillings in between layers of Pillsbury refrigerated pizza crust, you cut down on the mess of traditional pizza. Plus, calzones are perfect for dipping in sauces, from marinara to ranch. Pro tip: Try cutting your calzone into strips for easier dipping (or for small kid hands). This recipe is also great for customizing flavors to your specific taste. Want to put a vegetarian spin on it? Substitute the meat for spinach and feta cheese. Feeling adventurous? Try some chopped up pineapple for a Hawaiian-style meal. Do you know the best way to reheat your leftover pizza? Spoiler alert: It’s not the microwave. 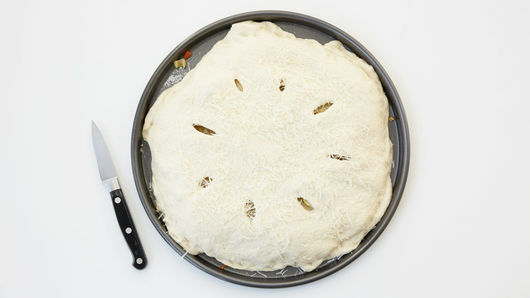 We’ve got the answer in our how to make pizza guide. Or, browse our calzones recipes for more ideas like Bacon-Cheeseburger Calzones or Lasagna Calzones.